FilConn offers several key technologies for use in mil-aerospace connector applications. The most common of these technologies is capacitive filtering. This filtering methodology is typically offered in three standard approaches. 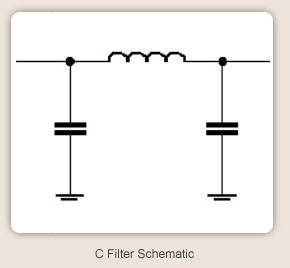 The most common of which is Pi-filter followed by the C filter and L filter technology. A brief discussion of each technology is provided below. The use of a Pi-filter technology as a means of reducing EMI energy through a connector has been around for over 20 years. The engineers on our design team were key to the early development of this technology and so have an understanding that is unmatched in the filter connector industry today. 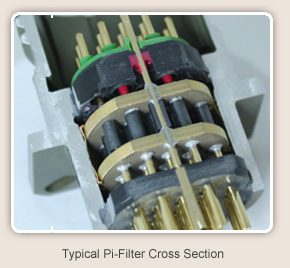 While a C-filter is less common in today's filter connector world than a Pi-filter, there are situations that require the use of a C-filter. 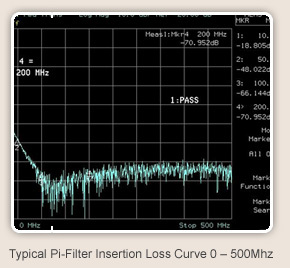 C-filter technology provides a less aggressive approach to EMI filtering but has the advantage of being packaged into small package outlines. In addition to the small package advantage, C-filter technology can also be used in applications where a sensitive frequency cannot be harmed. Can be incorporated into small package outlines. Lower cost structure than traditional Pi. In addition to the Pi and C filter technologies, FilConn can incorporate both "L" and "T" type filters into connector packages. At FilConn our years of experience allow us to provide options for specialized filtering requirements. If you have a unique requirement, call us today and discuss options with an engineer.